Days of intense planning for the big event. Nights spent wondering what to wear. Hours on the phone. Would you believe... it didn't ever happen? We (photographer Gene Trindl and little me) did manage to get on the set of "Man from U.N.C.L.E." We did manage to photograph David. I even said a word to him -- I believe it was "Hello." 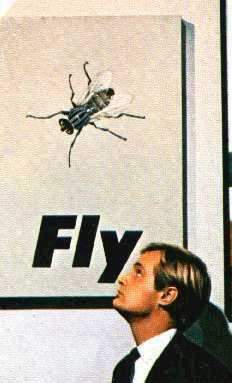 Just as I was about to launch to pitch for a short interview -- he left! So much for gurgle-slurp-McCallum. Substitute one crushed-disappointed-editor. David had to leave quickly because he was scoring a motion picture he just finished earlier this year, called "Three Bites of the Apple." He was working on the score whenever he had a few minutes off the set. Dave is thinking about doing a picture early next year; he's looking for scripts now. He has one that interests him, with an Australian locale, but it's still tentative. The movie scoring is a complicated thing -- especially having to do it in between other commitments. He was also working on a song called "In the Garden, Under the Tree" which will be played behind the movie titles. It will be a singe record, on Capitol, but it hasn't been decided whether David will sing it or not. Paul Francis Webster wrote the lyrics (he also wrote the lyrics to "Shadow of Your Smile"). 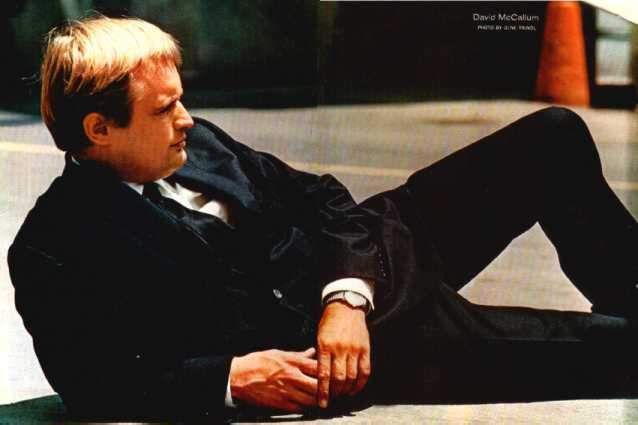 The story behind David's new role of motion picture scorer started in Italy, where "Three Bites of the Apple" was filmed. 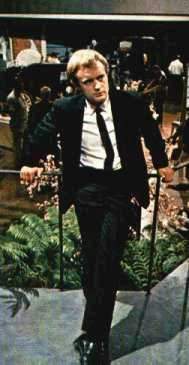 Alvin Ganzer, the producer-director, decided to have David write the music because of his enthusiastic interest in all aspects of the film, his musical background -- which more than qualified him -- and his ideas. David liked the music he heard in Italy, so he incorporated that into the score, adding a definite pop-type rhythm. Consequently, David was literally running from the U.N.C.L.E. set to the cutting room to the music department to Capitol Records to his dressing room... sort of a one-man production company. In spite of his schedule, David doesn't want to sluff of any part of his work. He knows what he wants, whether it's in a photograph, a scene, or a line of dialogue. He usually can set things up the way he likes, which naturally makes things go smoothly and quickly. He can't afford not to. He's on the set at 7:30 am, where he goes straight to make-up. When he's not needed on the set, he works in his dressing room on his projects, which in this case was the movie score. For lunch he also works on his projects. They usually quit shooting around 7:30 or 8 at night, sometimes much later. One night they shot at the studio until dark, then went to a local airport and continued shooting until around midnight. If David gets off early (early meaning around 8 p.m.) and there's a record in the works, he runs off to the recording studio (where he also spends many of his Saturdays). Now that the fall shooting schedule is in full swing, David's time is devoted primarily to U.N.C.L.E. David has developed a new interest since coming to America, we were told. He's an avid baseball fan and keeps a permanent box seat at Dodger Stadium right behind home plate. When he doesn't use the box, he'll pass out tickets to guys on the set. Although David at one time though stardom would be exciting, he now knows that there's a high price for it -- lack of privacy. One of the most pleasant days he can remember in a long time occurred in Italy, where U.N.C.L.E. 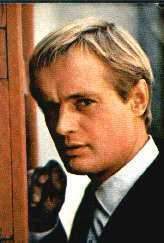 is not shown and where David McCallum is just another tourist. He rented a car and drove from Rome to Venice and just mingled and looked. No one recognized him. In spite of the no-privacy perils, David is one of the few stars who can keep out of the limelight and out of print. We don't know how he does it, but no one ever seems to see him shopping, dating, or just out and about. There is the possibility that he simply never goes out, but this is unlikely. He's human -- he must. We don't think he goes the disguise route, so it must take some careful planning -- or luck -- to avoid the stares and cameras of fans. But never worry, faithful (?) readers... TeenSet is hot on the trail and will attempt to resolve this modern-day McCallum mystery. 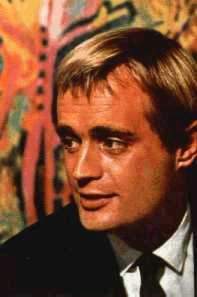 We will also attempt to get a real-live interview David McCallum someday!